The 円教寺 Enkyoji Buddhist Network has grown out of the missionary project of 長妙山 圓教寺 Chomyozan Enkyoji Temple, a small country temple in Saga, Japan. Over the course of the last 17 years this Network has grown to include many Sangha and Temples in the United States and Worldwide. We wish to support a unifying movement to foster the growing and founding of new Temples, Sangha and community groups with the same mission. Our practice is centered on the Lotus Sutra. We are dedicated to continuing the mission of our Founder Nichiren Shonin to spread this teaching to all Sentient Beings. The 円教寺 Enkyoji Buddhist Network does this through the organic growing of Buddhist Temples and communities. It is our vow to see this effort change the daily lives of millions. We have deep faith that this change comes through the teaching of the Lotus Sutra and the example of our Founder Nichiren Shonin. The 円教寺 Enkyoji Buddhist Network is built on an organic rather than static model or style, it is a living breathing entity like our symbol the Lotus Flower. We aspire to grow organically, celebrate our diversity and be of one mind with the teachings of the Lotus Sutra. Our network of communities is developing organically including many styles of study and practice. We are based in Nichiren Shu Buddhism and its traditions. Through traditional Buddhist practices we endeavor to develop and encourage methods of individual expression through practice and study. Our Network is nurturing and inclusive of developing Temples, replanted Temples, and existing Temples wishing to redirect their focus towards propagation of the Buddha Dharma. We accomplish this through supporting the growth of new Temples, Sangha’s and community groups with this mission for practitioners in remote areas or those without access to traditional Buddhism. The 円教寺 Enkyoji Buddhist Network includes many resources for education, practice and growth. 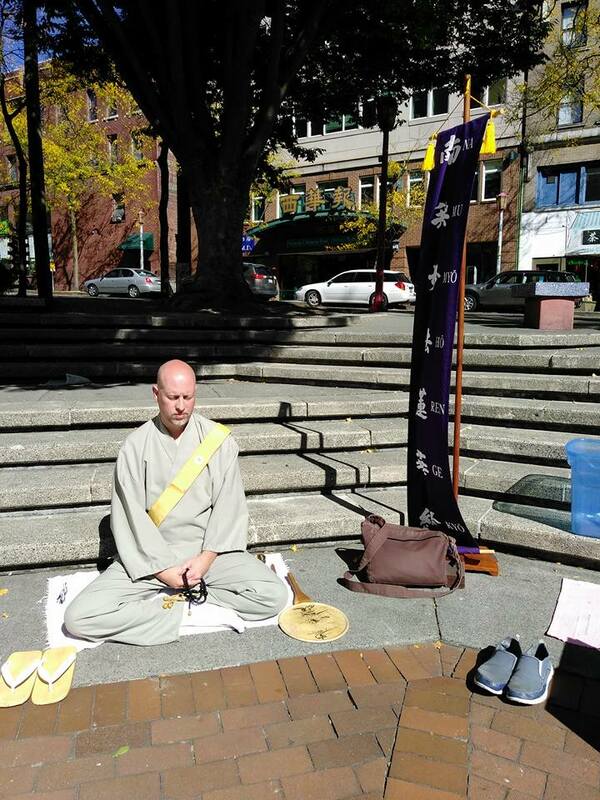 Our simple mission is to encourage a wave missionary zeal focused on the growing of new Nichiren Shu Buddhist Temples, Sangha and community groups. The mission of 円教寺 Enkyoji Buddhist Network is to bring together Buddhist Temples, Sangha and community groups in order to further the propagation of The Lotus Sutra and Nichiren Shonin’s Mission. The banding together of our various communities fulfills the mission that the Buddha and Nichiren Shonin directed us towards, “…we will expound this sutra in the worlds of Buddha’s of your replicas and also in the place in which you will pass.” (Lotus Sutra Ch. 21) This is accomplished through faith by planting new Sangha and Temples and replanting the seed of the Dharma in those areas with dead or dying Temples around the world. This is done by keeping in mind the character of Nichiren Shonin and his mission to spread the Lotus Sutra throughout the world, awakening all Sentient Beings through its universally enlightened teaching without fear. Our vision is to be a spirit-empowered network of Temples, Sangha and community groups, united in one mission to reach diverse communities and people in order to grow the seed of the Lotus Flower in their daily lives. This vision is achieved by nurturing daily practice and Dharma study while planting Sangha which in turn will grow more Sangha, in the same way as the Lotus Flower blooms and seeds at the same time. 円教寺 Enkyoji Buddhist Network is focused on developing the future leaders and missionaries of Nichiren Shu Buddhism to act as the vanguard for the Bodhisattva from under the earth to spread the Eternal Buddha’s Dharma in the age of Mappo (21st Century) as discussed in the Lotus Sutra fulfilling our Founder Nichiren Shonin’s vow. If you feel inspired by your Buddhist practice to start a community group, plant a Sangha, revive or replant Temple, please feel empowered apply to our 円教寺 Enkyoji Buddhist Network. All of our teachers and Ministers are here to support you and walk with you on this journey. Members of the 円教寺 Enkyoji Buddhist Network are encouraged and nurtured to become leaders through relationships with other leaders and teachers using assessments, training, and support to continue the mission of spreading the Lotus Sutra around the world. 円教寺 Enkyoji Buddhist Network functions as a resource to plant Temples & Sangha while developing the future Buddhist leaders around the world to further the mission of spreading the Eternal Buddha’s Dharma. We accomplish this through a variety of relationships, assessments, and development strategies. Relate – We endeavor to provide personal relationships to introduce practitioners to our network of Temples, Sangha and Ministers as well as resources and information on furthering study and propagation of the Buddha Dharma. Membership also provides access to national and regional events. We support the growth of the teacher-student relationship as fundamental to our practice. Assess – We provide a clear process for communication and support through Network membership, with an emphasis on Sangha building and practical evaluation techniques that set up members for success. Develop – We provide opportunities for Network members to continue to develop in their study and practice as well as opportunities to grow as leaders. One of our 円教寺 Enkyoji Network mottos is, “Doing is learning” action and effort are needed in leading and establishing new Sangha. Our goal is to produce and provide resources to help all of our Network members in accomplishing this aspiration. We consider the Lotus Sutra as personally experienced by Nichiren Shonin to be the foundation of our life. Sakyamuni Buddha who has been trying to save all the people from time immortal is the True Teacher embodying wisdom and compassion. We put our total faith in him. “Namu Myoho Renge Kyo” is the important means of training for us to obtain Buddhahood and we vow to uphold it in deed and spirit. Nichiren Shonin made a vow to cultivate the Buddha nature of all beings and to build the land of the Buddha. We consider him our teacher and vow to achieve this goal. We will always be aware that we are the Buddha’s children and will live peacefully together with all people in the search for truth. Kanjin Cederman Shonin, the leader of the 円教寺 Enkyoji Buddhist Network established our Mission with five core values.